Unfortunately for me my first Baton unit was faulty. I contacted the company and they sent me a new one. Now this one works as advertised. It’s incredibly ergonomic to hold and being very light makes it comfortable to walk around with during the night. The on/off button is firm. Also there is a LED light so only one glance tells you the state of the machine. The ‘Line In” jack at the side is excellent to accomodate a cable which can connect to a netbook or laptop. 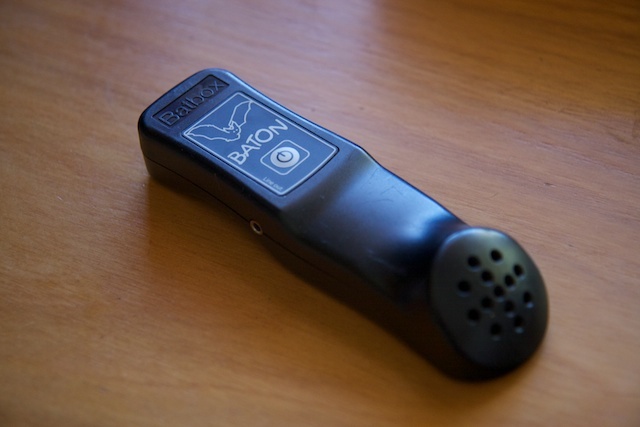 The supplied software works to show sonograms of the bat calls. On my wish list to improve this model I would like to see a wrist strap and an extra ‘Line out” jack to have the ability for a set of small earphones inserted. There is a constant “white noise” in the background but after a short time the ears tune this out. It’s not a big issue because your ears really listen for the “tick, tick,tick sounds rather than one constant tone. For its price I would highly recommend it. It does the job quite well.